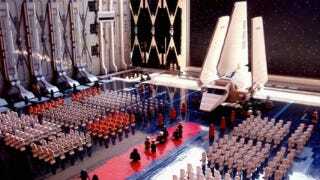 One amazing teacher has put together a 30,000-piece Lego recreation of the Death Star landing scene from Return of the Jedi. It is both glorious and tedious. Teacher Jay Hoff spent about six months recreating this scene from ROTJ. It cost him about $2,300 and took him around 30,000 Lego pieces. Amazing. Now make the Ewok village on the planet of Endor!